This week, Lehigh's football program officially kicked off their spring season, starting the series of practices that will start the process of bringing this team together for the fall football season. But that's not to say that the football team has been sitting back and drinking Yuenglings and sitting on the couch since November. Through Lehigh's strength and conditioning program, run by Ed Ruisz and Eric Marcovsky, Lehigh's football players have been working in the weight room since November in order to get to peak physical condition for the spring - and fall. When the football season ends, it's not all about planning the football banquet and then relaxing for three months. Head coach Andy Coen counts on Lehigh's strength and conditioning program to help instill discipline and work ethic, not to mention strength and agility, in those critical offseason months. "I believe our strength coaches do a great job training and motivating our players," Coen told me "I give them a lot of credit for our football success." 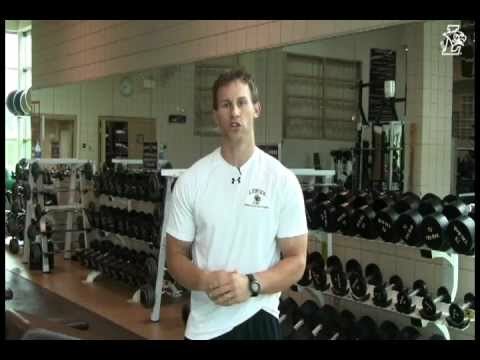 The strength and conditioning coaching staff, which includes former Lehigh LB Owen Breininger, comes up with different workouts for each day of the week during the off-season, coming up with different drills for different days to create a structure to the off-season that is there to set up for future success on the field. The full program is extensive and detailed, and has checklists to fill out specific goals and exercises. "The Strength and Conditioning Staff attempts to strike a balance between development of absolute strength, explosion, and agility during our off-season program," Ed told me. "Therefore our exercises range from conventional strength training routines such as the bench press and squat, to things like boxing drills on the heavy bag, resisted and assisted broad and vertical jumps, and numerous change of direction drills on agility ladders." The time the players put in the weight room is critical, too, as the Lehigh's coaching staffs' first impressions of the players looking to make the team next fall come right after the first round of off-season workouts. The other important aspect of off-season training is preventing injury during the upcoming season. "We also place a high emphasis on preventing injury in our training," Ed said, "so we constantly assess whether our players are over training while we always include exercises to strengthen vulnerable areas such as the tendons of the shoulder, the ligaments and tendons of the knee, the lower back, and the ankle. There is no 'magic bullet' but we believe there are always to tilt the odds more in favor of preventing a devastating injury through proper training." The other great aspect of Lehigh's strength and training program is how they allow the football team to stay together as a team, providing them with competitive goals and a working bond to carry them through the off-season. On the Strength and Conditioning webpage, there's a list of the current record holders in seven different training categories, including senior OL Shane Rugg, who recently broke OL Will Rackley's bench pressing record. "Since our players spend so much time together in the weight room during the off-season the Strength and Conditioning staff tries to foster a climate of enthusiasm and team unity," Ed said. "By constantly changing programs (no two programs in our off-season training are exactly the same) we keep our players mentally fresh and eager to train while by challenging them to improve their performances we encourage them to push each other to higher levels each day." Many folks look at a football team and are able to judge their strengths and weaknesses by what they've seen on the field. But the job of the folks of the strength and conditioning coaching staff to to build actual strength in the football players off the field, something that is a giant driver of actual success on the field.